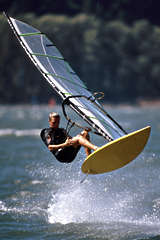 Wind surfing and sailing of all types, general aviation, gliding and hang gliding, flying model planes, motor sports, golf clubs, outdoor activity centres in the hills and mountains – the list of clubs and organisations needing current weather data to help plan and manage activities, and to maintain their facilities, is almost endless. By installing a weather station at your club/facility you can gain access to weather information that is both detailed and available instantly at the touch of a button. The weather sensors may readily be located up to 100-150m away from your clubhouse or centre to report the weather in an open – perhaps lakeside – area, with various options available to extend this distance up to 300m or more. Connecting the weather station to an inexpensive PC allows all the weather data to be logged in a permanent long-term archive for presentation, analysis and review in impressive graphic form at any time. Such a system could, for example, create a detailed record of weather conditions during specific club events. A special benefit for clubs in linking to a PC with an Internet connection is that the weather data may be relayed via your website and updated automatically at frequent (for example, hourly) intervals. This means that members can gain an accurate picture of current weather conditions at the club site before they leave home, simply by viewing the club website. See below for more information on running your own website. Wind data is obviously relevant to many outdoor activities for safety and other operational reasons. The Davis Vantage Vue and Pro 2 stations provide a wind update every 3 seconds to measure true wind gust data – a capability rare in affordable weather stations – and also provide readings of average and 10-minute mean wind speeds. Derived parameters such as dew point, wind chill etc are available from the console and are calculated automatically. Air density is a parameters of particular relevance to engine tuning and is calculated by the Weatherlink software. Knowing the current value of air density can give an edge in competitions such as motor sports, where Davis Vantage Pro systems have been used by Formula 1 and other race teams to monitor trackside conditions. With their ease of installation, low maintenance, automatic data storage and management, and internet compatibility the Davis Vantage Pro systems offer a durable, accurate system, at a price considerably more affordable than industrial grade weather stations, whilst giving performance that far outstrips most of the low cost weather stations. There are two key points to remember about creating weather report pages: Firstly, the layout of any web page is very flexible. You can include as much or as little information as you feel may be needed for your club’s purpose, ranging from a comprehensive presentation as shown in the example here, to a minimal set of text-only values, if that is your preference. The standard Weatherlink software supplied with the Davis data logger allows a wide range of web page designs and, should you want still more choice, there are third-party programs that add many further design options (see the compatible software page). Secondly, setting up your own weather-reporting website is straightforward for anyone with a basic familiarity with Windows programs and the Internet. The standard software has good templates to get your website up and running quickly. Alternatively, because the website software is based around standard HTML, any standard web page of your own club’s design can readily be adapted to include weather data in text or graphic form and to update automatically. Anyone with responsibilities for maintaining turf on golf courses or sports fields might wish to look also at our crop management page. At Prodata Weather Systems, whatever your leisure activity and weather monitoring requirements, we can advise on the system that will best meet your needs, and in particular on how to link your weather station to PC and how to create a weather reporting website. Please contact us with your requirements and we will be happy to respond promptly. 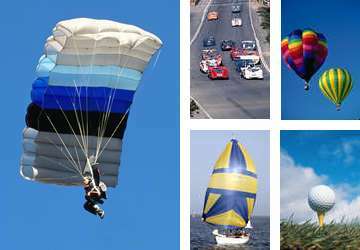 …And many other sports clubs, yachting and surfing clubs, golf clubs, motor racing enterprises, private airfields and flying clubs, etc.